Over the past thirty years, there has been a dramatic rise in the number of skyscrapers in the world as space decreases but demand for it increases. The advancement in engineering and technology has made such complex structures possible as newer and more innovate designs are used to combine the aesthetic appeal and strength of such buildings. There is also a competition among the world’s cities and countries to build the tallest buildings and draw the most number of people to it. Here is the list of the tallest buildings in the world as of 2017. This building in Dubai was originally called Burj Dubai and was completed in 2010. It was designed by Owings, Skidmore and Merrill based in Chicago and has 163 floors with a total height of 2717 feet. The building complex consists of thirty thousand residences, an artificial lake, hotels and shopping malls. It is also listed as the greatest engineering achievements in the world. It is one of the tallest Skyscrapers located in the UAE. The hotels are renowned for their extreme luxury and have drawn many foreign tourists. The observatory deck of the tallest building in the world is located at a height of 1483 feet or 452.1 meters and Total aluminium used in the tower weighs as much as 5 A380 aircraft. Burj Khalifa has received international attention and was an initiative of the government of the United Arab Emirates to divert the economy away from its dependence on oil and towards the tourism industry. Burj Khalifa is also considered to be modern architectural wonders around the world. The second tallest building in the world has 121 floors and measures an astounding 2073 feet. It is one of the three skyscrapers in Shanghai that are on this list of the tallest buildings in the world. The construction of the building was started in 2006 and was designed by an American firm named Gensler. It took eight years to complete, being inaugurated in 2014. Currently, it has the world’s highest observatory deck and offers a complete view of the Shanghai Skyline. Apart from offices, the Shanghai Tower also has hotel rooms and over one thousand parking spaces. It cost a total of 4.2 billion dollars. Also, the Shanghai Tower is the second highest hotel in the world that consists of 258 room, however, the world’s highest hotel is the Ritz-Carlton Hong Kong. You should also know about beautiful castles built around the world. The third tallest building is located in Saudi Arabia and serves as a hotel, a shopping mall, an observatory tower to observe the moon during the month of Ramzan, an Islamic museum and a conference room. It has a height of 1972 feet and was built by the Saudi Bin Laden group, the largest construction company in Saudi Arabia. This government-owned building was completed in 2012. As suggested by the name, the building is located in the city of Mecca and has a large clock tower. The building of gargantuan proportions has been constructed in a record time of 6 years from start to finish. The face of the clock has an area of more than 1000 square feet. The clock has 21,000 green and white lights that indicate prayer times and can be seen from more than 30 kilometres away. You must be interested in the most famous churches around the world. This tower is also located in Shenzhen, China and was inaugurated in 2015 through the construction is expected to go on until the end of 2017. The building has the office of the Pang An Insurance firm and also houses a mall, retail spaces, hotel rooms and a conference centre. It has a total of 115 floors with a height of 1965 feet. The tower can be easily seen from some places in Hong Kong like Lantau Island, Shatin, New Territories West Constituency. It uses double-decker elevators, which is a feature unique to this building. It is the second tallest building in China. Humans are building amazing structures around the world. We have also listed the most famous bridges in the world. 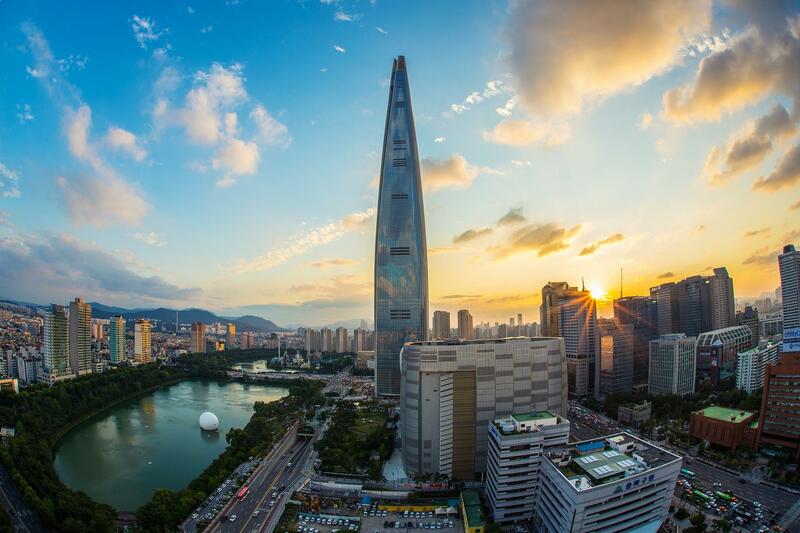 This building is built in South Korea and was planned for thirteen long years before the construction finally began in 2011 and was completed in 2016. It has 123 floors of which six are underground. It has a total eight of 1819 feet above the ground level. The most amazing feature of this building is that the roof is designed in such a way that the building can withstand earthquakes up to a magnitude of 9 on the Richter scale, which is common in South Korea. The tower is built beside the Lotte World Park and near the bank of Han River. This is the tallest building outside Asia measuring 1776 feet and is located in New York, USA. It was built as a reminder of the terror attacks of 11 September 2001 on the World Trade Centre buildings that stood on the same spot prior to 9/11. The construction was finally completed in 2014 and it was named after the North Tower of the original World Trade Centre. It has received positive feedback due to its message of a united world and its use of renewable energy and rainwater harvesting. One World Trade Centre is also the safest building in the world made up of high strength concrete that can withstand seven times more pressure than normal concrete. Also, it’s reinforcement steel bars that are significantly longer as compared to normal. Plans for future construction on the site are being made and include a 9/11 Museum and office complexes. The third tallest building in China and seventh in the world, this skyscraper is located in Guangzhou, China and has been built as a multipurpose space. It was completed in October 2016 and has 111 floors with a total height of 1739 feet. One of the tallest building in the world has been made adjacent to a large central park and a subterranean retail concourse. The transport interchanges have been made in all the building that will integrate it the city. The building has been made for multiple uses and therefore it has been made into four transitions, namely, office to residential, residential to the hotel, hotel to crown, and crown to the sky. It houses office spaces, over 1700 parking lots, a hotel on the top 16 floors and the world’s fastest elevators that can reach speeds of about 44 miles per hour. This building is situated in Taipei City, the capital of Taiwan and has 101 floors and a height of 1667 floors. It was the tallest building in the world when it was completed in 2004, soon superseded by the World Trade Centre in the US. The design of this building is a perfect blend of traditional and modern and it is famous for the blue-green tint to its glass windows. The engineering ensures that it is flexible and can withstand typhoon winds and earthquake tremors. This is the only skyscraper in the world that had concerts on the rooftop. Many singers and brands have held their concerts on its open-air terrace on the 91st floor. It is also based on the principles of sustainable development and has been awarded by the Leadership in Energy and Environmental Design (LEED). This is the fourth tallest building in China and the third tallest in Shanghai. Like the Taipei 101, it has 101 floors but measured a little less, at 1614 feet. Apart from being a finance centre, the building also has a shopping mall, conference centre, hotels and an observation deck. The unique designed has received much praise for its flexible structure that balances out the pressures due to the presence of people, the heavy machinery and the wind force. It also uses a Variable Air Volume system for air conditioning. One of the tallest buildings in the world. The tower has the world’s highest Chinese restaurant with a height of 416 m located at the 93rd layer in the building. This building is located in Hong Kong and was completed in 2010, at which time it was the fourth tallest building in the world. It has 108 floors and measures 1588 feet. It has the highest swimming pool in the world located on the 108th floor and also houses shopping malls, hotels and 5-star restaurants. The 10th tallest building in the world is the tallest in Hong Kong. It contains the world’s 2nd highest hotel and world’s highest swimming pool. Also, a bullet train station is being constructed underneath. It is interesting to note that twenty years earlier, most of the tallest buildings were located outside Asia, in Europe and North America, but today, none of the top ten tallest buildings are in Asia with a majority being in China. However, even as you read this list, newer and taller buildings are being planned. The Jeddah Towers in Saudi Arabia are currently being built and will be completed in 2019 having a height of 3307 feet, surpassing the Burj Khalifa. Innovation and superior design continue to progress are more and more skyscrapers are being built. However, this could have a potentially harmful impact on the environment which is being overlooked in the race for building the tallest structure.